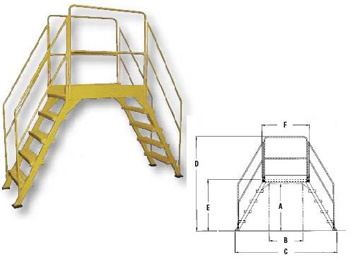 Cross-Over Ladders mount where you need permanent access at crossover points. The upper platform features removable two sided 42" high handrail with 21" mid-rail and fixed 4" toeboards to prevent objects from rolling off. Serrated steps for extra grip and safety are 24" wide and 7" deep with a step height of 10". The angle of the steps is 58°. The overall ladder width is 29". Ground legs include rubber feet for stability. All welded steel construction with removable handrails. Capacity is 500 lbs. Meets OSHA standards. See chart below for specs.